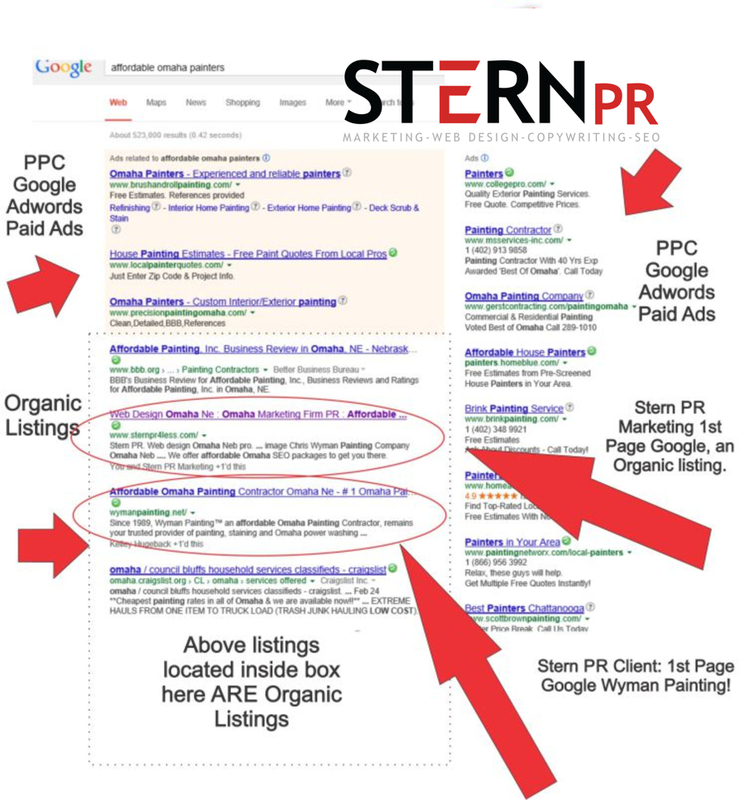 We here at Stern PR™ do organic SEO and PPC (pay-per-click like Google’s AdWords) advertising, having earned our wings as a premier search engine optimization marketing Omaha Neb. provider. We highly recommend organic SEO for ALL clients. Businesses on a limited budget greatly benefit from organic SEO strategies due to low cost compared to PPC. Here’s the scoop. Google AdWords can be very expensive and cost prohibitive to many small and medium-sized businesses especially if the industry keywords are highly competitive that you hope to rank for on the 1st page of Google. Why organic versus PPC? Because Google AdWords can be very pricey. It works like an auction. The more competition for the keywords that your company hopes to rank for, the bigger the investment. For Omaha HVAC, it can run $16 per click. That means every time someone clicks your ad, you are charged $16 bucks! It’s no surprise that unscrupulous competitors may play the click fraud game, and wipe our your monthly PPC budget quick. Where is Organic SEO On Google? Organic SEO refers to the listings located in the center of your screen of Google’s search results, as the image above shows. These listings are NOT paid for, but are targeted through content created by your affordable Omaha SEO strategist and other external factors. Likewise, pay-per-click listings reside on the right side of the screen, and we KNOW that fewer people go there. The shaded listing on top IS the prime spot, too. But it’s Google AdWords pay-per-click. Research has demonstrated and it is our belief that most people look at the center (organic business listings) and top (Google AdWords PPC) of Google’s search results. To get to the shaded top section, you have to place the highest bid in Google AdWords. In other words, the downside of having a listing on the top of the page is that this section can cost a lot of moolah. Of course, if you have the marketing budget, your organization would greatly benefit from doing both Google AdWords PPC and organic search engine marketing. Again, Stern PR™ suggests Google AdWords pay-per-click advertising if a client is armed with a decent monthly budget and needs a quick way, off the bat to appear on the 1st page of Google for competitive keywords not ranking high yet. Now if you keywords are not very competitive, most can run a PPC campaign on the cheap. In general, company owners must realize that it takes time and patience to move up the search engines for any given keyword in organic SEO. It’s not uncommon to take months and even years. However, it can be done! Stern PR™ has been able to get client websites, videos and press releases on the 1st page of Google within 48 hours. Generally, it can take weeks (s) or months to obtain 1st page position. Read this disclaimer. No Omaha SEO company should ever promise 1st page ranking. If they do, run. Search engine position solely depends on third party search engine algorithms, and is completely out of any SEO company’s control. Success depends on both luck and continuing education by your search engine marketing Omaha provider. Here at Stern PR™ we spend considerable time continuing our education in white hat SEO strategies. In total, with 90% of people going online before buying a product/service, you need to rank on the 1st page of Google. To get there, you need a monthly search engine optimization plan, that includes organic SEO. To build and maintain search ranking, you need to hire an Omaha Internet Marketing specialist, well-versed in social media, marketing and public relations on and offline. Don’t hire techies either. That’s a bad move you will regret for corporate identity branding. A word to the wise. Almost zero Omaha SEO companies and Nebraska Web Design firms offer professional copywriting services. Nope. Instead, most local web designers and SEO marketers write sub-par, to say the least. Yawn. Boring. Why? They’re technical people only. Businesses should avoid these companies who claim to specialize in Omaha SEO and Web design. Overall, poor writing is bad for corporate identity branding. Make sense? “I’ve read the writing that many Omaha SEO companies have done. It is not professional at all. Most lack the ability to pen anything of value, including a great website, news release and social media posts. That’s what differentiates us, Stern PR Marketing™, from competitor search engine optimization companies in Omaha Neb.,” emphasizes Susan Stern, a veteran copywriter. Stern PR Marketing™, a small SEO Omaha agency has a professional copywriter on staff indeed. Turn to owner/operator Susan Stern, who brings to the table 20+ years of experience in on-air broadcast news reporting, PR and Marketing writing, strategy and consulting. Stern PR™ serves clients from Maine to California, beyond Nebraska’s border. Stern has a proven track record of producing public relations work that outsiders think was produced by a Big Omaha PR Firm of 5-20 practitioners. People have written online about the Big PR Agency in Omaha, Nebraska known as Stern PR Marketing™. We are appreciative. But the fact is we are a team of two, expects in many fields: TV, Radio, Print AND Internet. Small agency, but an effective provider. “Businesses come to us for outstanding marketing, advertising and public relations agency work without the large overhead that big firms pass on to customers,” notes Susan Stern. The fact is. It’s just Susan Stern behind the keyboard handling strategy and implementation: website content writing, advertising, graphic design, Omaha video production, press releases, social media – you name it! Marketing with an outside the box mindset. Creative. Stern, works together with Austin Scott, a superior Omaha Web Developer, who spearheads web design tasks for Stern PR Marketing™. Stern PR™ IS your organization’s one stop shop for everything business consulting in Omaha Nebraska. Plus, Stern PR™ offers Omaha SEO services aplenty. You’ve heard the history. Now you’ve learned about Organic SEO and PPC, so take the next step. Inquiries? Contact Stern PR Marketing™ now. Reach Susan Stern direct. Leave blog and visit official website! 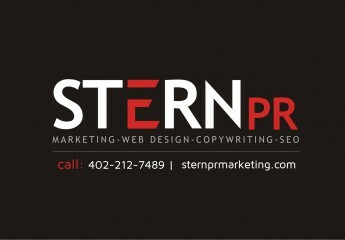 ← Affordable Omaha SEO Company | Stern PR™ Unveils Monthly Plans!